An average match that went exactly as expected. The ending made it even less enjoyable. This was more of a minor plot point in the Reigns storyline rather than a match. Dean Ambrose runs out to the ring to help Reigns fight off three-fourths of the League of Nations. Ambrose runs along the apron of the ring and dives, inadvertently hitting Reigns with a diving lariat. Ambrose gets dragged into the ring, then Reigns grabs a chair and chases off the bad guys. ** The recently turned mega-heel Lawler went on about how Ambrose hit Reigns intentionally. I like heel Lawler (and he was very much needed to offset the mega-babyface Saxton), but I do wish he would be more reasonable. I like it when the heel is the reasonable one. He did have a good point during the match though. Saxton was talking about how Triple H will do anything to keep Reigns down, but Lawler countered by asking Saxton if he really thinks Triple H would rather face Brock Lesnar (if he wins the number one contender spot as Fastlane). I’ve wondered that too. Renee Young asks Ambrose about hitting Reigns. Ambrose says it was an accident. He gets a little out of control at times. He says he and Reigns hit each other sometimes, and sometimes they hit other people. This was a fun match that helped both guys look good. It was very fast-paced. It really felt like Owens was just trying to keep up with Kalisto for a good portion of the match. That’s not to say Owens looked bad. Not at all. There just wasn’t a whole lot of down-time for Owens to jaw with the crowd or Ziggler at ringside. Owens did attack Ziggler during the match in one of the ways that I always love, he powerbombed Kalisto into Ziggler. I love that. Jojo welcomes The Miz. Miz interrupts Jojo and says he would never interrupt anyone. He complains about AJ Styles being ungrateful. Not a bad match. Ryback wrestled the match in black trunks, black boots, and black gloves, a far cry from his usual getup where he looks like a walking merch booth. The commentators mentioned something about going back to basics, and I hope that’s what he’s doing. The match was kind of a basic big guy match, but it wasn’t bad. Ryback didn’t really do any theatrics either which I like. Hopefully this is a start in a different direction for Ryback that I can get behind. Renee Young asks Becky Lynch about helping Sasha Banks when she was attacked by Naomi and Tamina. Before she can answer Sasha walks up and says she didn’t ask for help. They then argue about helping each other and end up angrily agreeing to work together. A solid, good match. I particularly enjoyed the ending where they used a sequence similar to what beat Jericho on RAW, but Miz got out and they moved on to the real finish. It showed that AJ has a lot of different ways he can put on a match. It makes him look more dangerous that way. 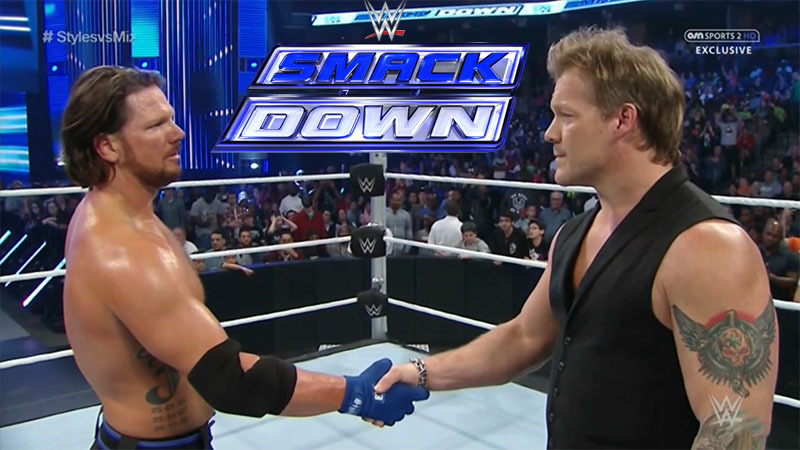 After the match, Jericho gets into the ring and tells AJ that he is impressed. He knows that AJ is good, but he wonders if AJ is great. He wonders if AJ has what it takes to beat Jericho twice. Jericho proposes a rematch for next week. AJ agrees. They shake on it and AJ pulls Jericho in like Jericho did to AJ after their match on RAW. He tells Jericho that he’s not just great, he’s phenomenal. Jojo asks Reigns about Ambose hitting him. Reigns said he knows it was an accident. They might not always be on the same page, but that’s what he likes about their friendship. New Day talks about their gold. They are butterflies and everyone else is a caterpillar. The Social Outcasts (minus Bo Dallas) comes out and Adam Rose points out that the tag titles are actually bronze and not gold. They also say they will take the belts from New Day’s waists. New Day says the Outcasts will not touch their waists. The Outcasts say they will touch them. Curtis Axel stops everything by saying that the New Day thinks they are rhinos. Very good match! There were some very good and unique segments in this match. One of them involved Woods seemingly showing off and having fun which at first made Adam Rose look a little bad, but then directly led to Adam Rose getting an advantage. Another segment involved Kofi and Axel countering each others moves in an extended chain. Then the match broke down in a great way. The finish was very well done and made great sense. This whole match just came together very well and told a great story from the pre-match talking all the way through to the final bell. Okay match. Alicia Fox made it fairly competitive, but there wasn’t anything very surprising here. I still don’t really like the Figure Eight though. Bridging a figure four doesn’t really seem like it would hurt more. The pressure in a figure four works by pressing down, bridging seems like it would mostly release that pressure. Earlier today, R-Truth complains about some charges on his hotel bill. Goldust, dressed as a bellhop, again tries to get Truth to join him and winds up going through Truth’s luggage. A pretty good match, but the inclusion of Ambrose hitting Reigns again felt predictable and forced. Hopefully it goes somewhere interesting. Also, Barrett and Del Rio just kind of bailed on Rusev at one point in the match which I thought was odd. There were some very enjoyable moments and some surprisingly good matches here along with the usual stuff that Smackdown produces. It’s a good watch. I figured a match between these two groups would be good, but I was still surprised by how much I enjoyed it. I’d like to see this keep going for a little while, maybe until a little while after Bo gets back.